One of the Beverley Regional Airshow organizers, Paul Johnson, happened to be in Reno Nevada last year and stumbled across the DR1 Championship race. The Flight4CF organizers (Rich Little and Paul) see UAVs as the future of aviation and want an example of this at their airshow. So with that said they were invited to be a part of Beverly Airshow Flight4CF this past weekend (Sept 8,9th). We had the opportunity so showcase the up and coming fast moving FPV Drone racing. Some of you that watch sports have probably seen this on television. This has taken off like wild fire. The amount of concentration and skill to fly drones with goggles on though the race gates is something that the Jetson's couldn't even do!! A construction crew was formed with Jason, Tim, Nick, Aaron, Ross (not pictured), Doug A. (not pictured), Mike (not pictured), Dave (not pictured). It took all day Friday, before the Air Show, and into the evening to erect the “Rotor Dome”. The construction team was so worried something would go wrong, and some said they didn’t sleep much that night. They thought the net structure might not stand or it would be too much of an eyesore or something else unacceptable. They were wrong! The net stood well enough, and pilots that I look up to, seemed more than pleased with what we had built. Though out of sight for most of the event, many spectators had found them, none the less. Most people had at least heard of FPV drone racing and were interested to learn more. All were blown away by the skill and precision some of these pilots possess. Chris, with Doug Kling’s assistance (both pictured), sanctioned Sunday the afternoon races as an official MultiGP event. Thanks Paul Johnson and your guys for helping make this event memorable for all that saw this event! Well day 2 is in the history books. It was a fabulous day at the Flight4CF (Cystic Fibrosis). It started out with paratroopers and then the show was on! A little different format with the flight schedule that ended up with our team flying 4th and then closing out the flying portion of the event! Boy it did not disappoint! We had Cody Wojcik leading off with his world class freestyle 3D flight with his Yakk 54 whipping the crowd into a frenzy! Second was Scott Geller bringing the crowd to a captivating performance with his A-10 Warthog!! After Scott landed we were graced with Cody and Chris demonstrating two different examples of power! Cody was flying his electric airplane that reached speeds of 140mph :O and Chris flying his turbine! The pièce de résistance ended with Scott Geller flying his beautiful BAE Hawk in the camo scheme! It was marvelous to say the least!!! This was a spectacular weekend and I am glad that we (Plum Island Airport RC Club AMA # 5198) was asked to be a part of this wonderful event! A big thank you to all the RC Pilots that participated in this event that was just as amazing as watching the full scale aerobatics that had the crowd screaming with enthusiasm! I want to thank Richard Little who put this whole project together for his charity called Flight4CF (Flight for Cystic Fibrois) This charity is very dear to his heart as his daughter goes through this fight with cystic fibrosis! What better way to fight this and contribute to find a cure for this terrible disease that people such as Rich's daughter deal with in their daily lives! I also want to thank Larry Roper for coordinating schedules with Scott Geller that allowed Scott to come all the way from Andover New Jersey to be a part of this air show. I don't think that anyone would mind if I said that Scott and his magnificent flying machines were the highlight of the show! I also want to thank our pilots Larry, Chris and his girlfriend Danielle, Cody Wojcik and his father Ted Wojcik, Jim Caloggero, and our AMA District VP Andy Argenio for spending time with us all day Saturday and splitting his time with us on Sunday. Andy attended another important event that was being held in Concord New Hampshire today too. This event was well represented also as Daren Hudson District 1 AVP was the CD for this wonderful fundraising event that we were fortunate enough to be a part of last year! Here are just a few more photos of this magnificent event that was exciting to be a part of as it was to watch! We are gearing up for this great event this weekend. It's going to be great weather. I am looking forward to this airshow to benefit Cystic Fibrosis. Please so please join me! Come on out and have some fun and see some really cool airplanes. There will be airplane rides and all kinds of activities for families and kids to participate in! So many different types of aircraft to see up close and personal. We will be having a radio control jet demonstration from Scott Geller. He will bring his 4 meter Leonardo and you won't want to miss this! Scott is one of the premier RC Pilots on the East Coast with incredible skills. There will also be members of our Plum Island Airport RC Club AMA # 5198 demonstrating their skills too! I attended the Rutland County Radio Control Flyers FUN-FLY on Saturday July 14th. It was a 3 day event but I was only to attend for a day and half. It was held at the Fair Haven Municipal Airport in Fair Haven, VT. When I got there and saw the manicured cut runway with open sky surrounding it I was amazed. They had the perfect place to enjoy the hobby! The club members were welcoming and very nice people to spend time with. We talked, laughed, and flew all day! The atmosphere was so relaxing that I felt as if I were a member! There were all kinds of planes represented. They had war birds, cubs, sport planes, FPV, helicopters, and yes even jets!! I flew two of my jets and took a little video of the event from an aerial perspective. (The other times I flew I forgot to turn the camera on!) :P lol Any way I am looking forward to attending next year! The Rutland County Flyers have one of the best venues that I've ever visited. The scenic views on the way to the field were spectacular!! The mountains were full of vibrant chlorophyll. Now I understand why they call Vermont the "Green Mountain State"! ;) This little video will show you the beauty of the Green Mountains! Thanks for the hospitality! Through the hard work and coordination of Daren Hudson District 1 AVP on Saturday May 5th, 2018 (Cinco De Mayo) AMA District 1 club members along with our District 1 Vice President Andy Argenio were invited to be participants at the Boy Scouts Of America NHX Jamboree held at Loudon Speedway in Louden, NH. There were many activities for the Scouts to enjoy at this event. There was NASCAR racing, Go-Carts with speeds up to 80 MPH, rock climbing, and a Unites States Army Black Hawk Helicopter fly in with show and tell, classic cars, and numerous activities throughout the day! Daren Hudson and Andy Argenio were able to have the Academy of Model Aeronautics RC Airplane Simulator Trailer be present to give the kids the experience of flying a radio controlled airplanes with out the risk of "real time" cost associated after a mishap!! AMA District 1 was well represented by different clubs from the New England area. I'd like to personally thank and acknowledge District 1 VP Andy Argenio, Daren Hudson District 1 AVP, Johnnie Yaz District 1 AVP, Concord Skyhawks, Andy Fagan Freemont Flyers, Plum Island Airport RC, Fremont Flyers, Southern NH Flying Eagles, and ALL of the New England District 1 AMA Club Members that I didn't list for donating their time, skills, and assisting with buddy boxes! Please forgive me if I left any clubs out. Your clubs participation was well represented and I am grateful to you all. All of You guys gave the Scouts a memorable flying experience that will hopefully spark interest in aviation or engineering! I can't thank you enough for your dedication to our hobby! Finally although Daren Hudson (D1 AVP) was not able to attend, the AMA portion of this event would not have been possible without the hard work and dedication to our hobby that Daren brings every day!! Daren's Ambassadorship and dedication as an advocate to our hobby is never ending and deserve all the recognition for pulling this together to make it a success!!! Thank you Daren. I have posted some photos of the event and here is a link to some of them. "It's All About The Hobby"
New season, New pilots, New Instructors! Time to dust the rust off as 2018 Flying season in District 1 gets underway. This Blog is intended to be a “living” document where techniques, anecdotes and quality instruction information can be shared. Please share and check back often. We all know great pilots don’t always mean great instructors, right? How about getting together area club: long time, brand new and those interested in instructing together at a host field to discuss techniques, setups, lessons learned, anecdotes and other beneficial information to share near and far so we can all do our best to train the next generation of model aviators? Great pilots and great instructors are constantly learning and relearning to be the best they can to serve their students and get them up and away safely and quickly with a solid foundation and a full “tool box” to expand on themselves through productive practice with purpose. Please share this around and let’s try to pull off a few of these this year. 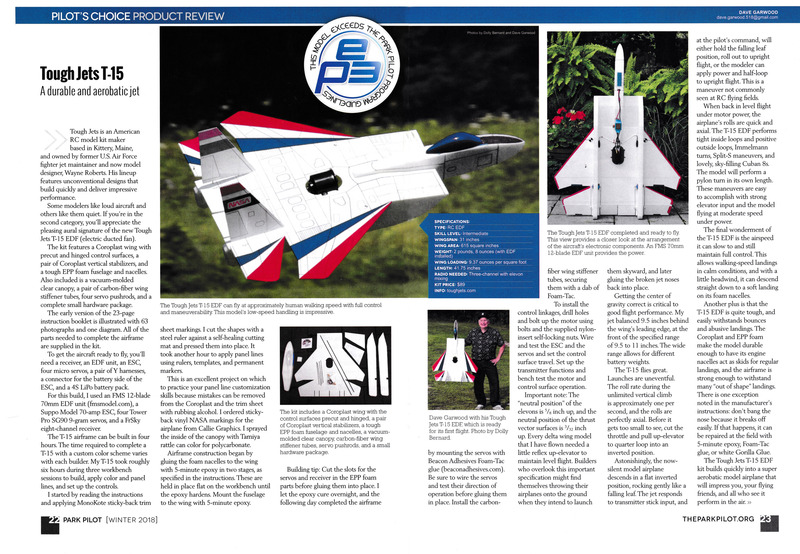 Join us in congratulating fellow District 1 member Wayne Roberts, owner of Tough Jets for being featured in a Park Pilot plane review. Wayne is a regular at open flying events at Plum Island Airport and other locations throughout the region. Well done Wayne. If you haven't tried one his Tough Jets they are a blast. Editorial- What do we REALLY know about our Communiuty Based Organization- AMA? I've been a District 1 AVP (Associate Vice President) for just over a year now and I've been getting around the region and interacting on social media to get a better pulse on what our membership really knows about AMA. My conclusion, unfortunately is not too much! That's not necessarily a bad thing for a hobby organization or a club. I'll admit before getting more engaged myself I didn't realize how many benefits, programs and how much support and outreach assistance resided inside AMA. However, for the largest "Community Based Organization" representing modeling it is somewhat alarming and deserves attention. In this time of split second communication and an enormous amount of information available at a moment's notice why don't more of our members and officers know more about the organization they belong to, represent and promote? It could be there is too much information or many members choose not to utilize the vast array of technology for communicating or they just want to pay their dues and fly their model planes or enjoy whatever part of this diverse hobby they gravitate to? Here's the problem with the “I just want to pay and fly” or "pay and play" option of membership. The hobby industry and AMA has been challenged from many obstacles over the past decade from market pressure on local hobby shops to the proliferation of the drone market and resulting tsunami of crazy legislation from municipalities to Washington affecting all aspects of the hobby. While all this was eroding the fabric of the "traditional" hobby of modeling, innocent enthusiasts trying to enjoy their pastime were feeling these pressures; having difficulty finding parts and supplies locally, club rosters suffering for conflicts over different "new" disciplines entering the hobby, flying fields and facilities being lost due to encroachment and noise issues, reduction in new entrants into clubs. Those "paying and playing" and not becoming engaged or even informed in the chaos saw dues increasing for the first time in years, started hearing more about government relations, legislation and advocacy when all they wanted to do was get their insurance and play with their models. The world had changed under their noses and their "Community Based Organization" which supported their beloved hobby quietly in the background with huge events to enjoy, programs of all kinds, benefits reaching far beyond insurance, outreach to schools with STEM programming and much more was now reaching out for help. Why? Because it was under attack and needed a "call to action" from it's troops, the ones who love the hobby, who know the most about how well the safety code works to mitigate threats, the benefit of assistance with procuring and sustaining flying facilities and more. All those things happening in the background with little fanfare for all those years was great. Now, unfortunately due to outside forces the organization required members to become informed and advocate. To inform and educate those outside the hobby since they were threatening the relationship established with the FAA because of the success of that safety code and threat/ risk mitigation held for decades. Why? because they too were not informed and educated on the very activities they were attempting to govern. Who better to educate and inform them than the group who had done it successfully for those nearly 80 years? So, here we are. A Community Based Organization recognized by the FAA seeking it's "community" for help. Lawyers to lobby in Washington costs $, the creation of a department known as Government Relations, not needed a decade ago, to focus on needed advocacy, PR and communications cost $, increasing the outreach to communities, local, state and federal agencies cost $, the list goes on. So yes, the dues increased to cover these new needed expenses to protect and defend the hobby we all love. AMA is actively improving resources and communication avenues to help members help the organization and the hobby. The website is being revamped and constantly experiencing improved access. A great starting point is the Membership "Benefits of this Organization" page and another resource for what's going on is the Government Relations page These are only two resources. How else can and is AMA helping you help your organization? Soon you will be seeing a "Government Relations Advocacy Tool Kit" which will include methods and materials to easily advocate for your hobby and AMA with local, state and federal government agencies. In addition, districts are increasing the number of AVPs and there is a new initiative to encourage each chartered club in AMA to have an engaged "Leader member" who will act as liaison to the AVPs to provide a better source of accurate information being passed to members. AMA realizes that there are areas that need improvement and we are working to do just that but we need the help of members to speak up and share concerns. So what can YOU do? Become informed, reach out to your representatives in AMA: your club officers, leader members, district AVPs, VPs through district website forums and blogs and district social media sites, the AMA website and FB page, and AMA HQ contacts through email or phone. Give us your feedback- if you see something say something! Reach beyond the hobby community when the opportunity exists to inform and educate and introduce new people, young and old to the hobby. Advocate for your hobby however you can and do all this while you are enjoying the ability to have fun with your pastime, it will only continue to exist if we come together as a "community" within this Community Based Organization of the Academy of Model Aeronautics. I welcome your feedback anytime. Flying Site Preservation through Cooperation- A Success Story! Plum Island Airport RC Flyers AMA 5198 serves as an example of one success story in District 1. There are more in the region and we are asking you to share them here By “add comments” to this blog. Sharing the successes and learning from them will go far to help more clubs in New England and beyond secure and preserve flying sites. Continued brush clearing maintenance at Plum Island shows how working with land managers, and AMA created and preserves a superb flying venue to serve the community, modeling and aviation. New President of Plum Island Airport RC Flyers Club, Larry Roper was on scene as the clearing of over-grown brush adjacent to the runway took place. The club was awarded an AMA flying site grant 2 years ago for initial clearing. That effort included volunteers from our club, other area clubs and MA Boy Scout Troop 44 (you may remember them from our Aviation Appreciation Day- Plum Island Aviation Appreciation Day for Scouts 2016) all coordinated through the Historic Plum Island Airport management. With the help of a hired machine and operator we hope to keep the area from the wind sock to the runway more manageable with a mower. This will serve the many full scale users of the historic airport as well as the many modelers who visit Plum Island to fly in our events annually. As Larry reminds us in this video, community and land owner relations is key to retaining quality flying sites. Part of that is community outreach and capital improvements that benefit all stakeholders. Remember that AMA has flying site resources including: pdf and video series on acquiring and keeping sites, grant program to financially assist clubs who qualify and testimonials such as this about success stories. Larry provides a video of the work taking place at Plum Island which is good reminder for us all. Please post your stories, questions and “add comments” to this blog.